Paul Stovell was watching a talk I gave with Keith Pleas at Teched US 2006 on building your own Enterprise Framework. The basic jist was that architecting/designing/building a framework for other developers is a different task than coding for end users. One thing that is valuable for context is that Keith and I were playing roles in this presentation. Keith was playing Einstein in his Ivory Tower, the developer who wants perfect purity and follows all the rules. I was playing Mort the realist, the developer who just wants to get the job done. We went back and forth with white slides for Keith, Black for me, each of us declaring the extreme view, then coming together on the final slide with some pragmatic and prescriptive guidance. Frankly, I think this is crap. For goodness' sake, Paul, don't sugarcoat it, tell me how you really feel! ;) Just kidding. He has some interesting observations and (some) valid points. I mostly agree with this. However, you certainly need to have SOME idea of what they are using it for as you're on the hook to support it in every funky way they might used it. It is reasonable to have some general parameters for how your API should be used. If you design it poorly, it will likely get used in ways that may end up giving the developer a bad experience or even breaking the app. For example, in a logging service we had a method called ConfigureAndWatch that mirrored the log4net ConfigureAndWatch. It's meant to be called once per AppDomain, and never again. Because it was not only poorly named (since we too the internal implementation's name) and it didn't offer any suggestions (via exceptions, return values, or logging of its own) some users would call it on every page view within ASP.NET, causing a serious performance problem. There's a number of ways this problem could be solved, but the point is that there needs to be a boundary for the context in which an API is used. If we had constrained this more - and by doing that, we think we know more than they do - then some problems would have been avoided. This little bit of inspired brilliance was not my idea, but rather Brian Windheim's, an architect at Corillian. We had an application that consisted largely of base classes and developers were insisting that they needed infinite flexibility. We heard "infinite" from the developers, but not the business owner. Brian theorized that they didn't need as much extensibility as they thought, and shipped a internally basically sealed version. When folks needed something marked virtual, they put it in a queue. The next internal version shipped with something like 7 methods in one class marked virtual - meeting the needs of all - when originally the developers thought they wanted over 50 points of extensibility. 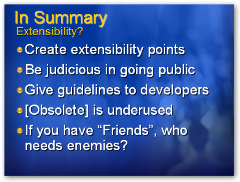 The point of Brian's exercise was to find a balance between extensibility, both explicit and implicit, and supportability. When you mark something virtual or make a class public, as a developer framework designer explicitly expressing support for the use of that API. If you choose to mark everything virtual and everything public as Paul advocates, be aware of not only the message you send to the downstream developer, but also the unspeakably large combinatorics involved when that developer starts using the API in an expected way. Cyclomatic complexity can give you a number that expresses the complexity of a method and offer valuable warnings when something is more complex than the human mind can comfortably hold. There are other tools (like NDepend and Afferent Coupling, Lattix and it's Dependency Structure Matrices and Libcheck and its measure of the churn of the public surface area of a framework) that can help you express the ramifications of your design decisions in fairly hard metrics and good reporting. If you mark all your classes and methods public, be informed of these metrics (and others) and the computer science behind them and acknowledge that you're saying they aren't right for you. Just be aware and educated of the potential consequences, be those consequences bad or good. Can you honestly rely on people who are "just playing" with a technology to tell you which bits they will need to be extensible 12 months into the future? You totally can't. When you're designing for Users, you do a usability study. 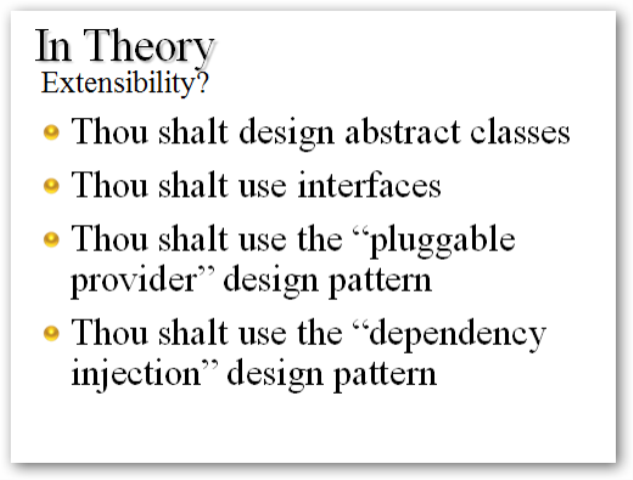 When you're designing for Developers, you need do a a developability study. Microsoft actually does more of this than most folks think. Sure there's the Alphas, Betas and CTPs, but there's also TAP (Technology Adoption Programs) programs, Deep Dives where folks go to labs at Microsoft and work on new technology and frameworks for a week while folks take notes. These programs aren't for RDs or MVPs, they're for developer houses. If you're interesting, ask your local Microsoft rep (whoever organizes your local Nerd Dinners perhaps) how you can get into an Early Adopter Program for whatever technology you're hoping to influence. They really DO listen. We just came back from a Deep Dive into PowerShell and got not only access to the team but a chance to tell them how we use the product and the direction we'd like to see it go. Scotts [sic] philosophy, and that of many people at Microsoft (and many component vendors - Infragistics being another great example), seems to be to mark everything as internal unless someone gives them a reason to make it public. That's not my philosophy, and I didn't say it was in the presentation. It was part of the schtick. The slides looked like this with Keith as Ivory Tower Guy first, then Me as Realist guy, and the "in actuality" slide last with guidance we could all agree on. However, I still think that marking stuff internal while you're in your design phase is a great gimmick to better understand your user and help balance good design with the important business issue of a supportable code base. Paul's right that it is frustrating to see internal classes that do just what you want, but simply marking them public en masse isn't the answer, nor is marking everything internal. 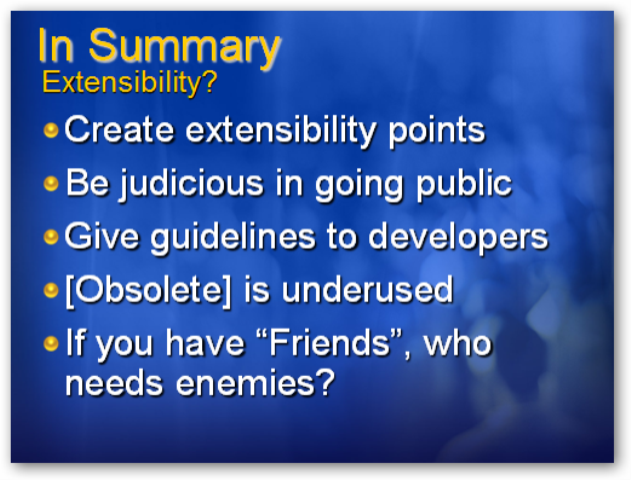 this 'you need do a a developability study' concept is like jeffrey snover's discussion of using commandlet's as the public facing api and otherwise keeping classes private. jeffrey's insistence on 'technology that matters is technology that yields an economic advantage' can act as a good yard stick, focusing on "what practical and beneficial uses can these classes have?" (rather just the superset of all possible uses) -- although this line of thinking probably also gets a bit vague and philosophical in practice. One of the problems Paul has likely faced is with third party vendor components and their internal/sealed state for their properties and methods. Keeping it real, we have faced problems time and again with the Infragistics GridView because it internalises a lot of stuff we want to do. Basically, the developers at Infragistics have prescribed a set of behaviours that they expect to be followed and as a result we found that occasionally we just couldn't do the job that we were asked to do. I actually like the idea of internalising everything and letting the consumers tell you what they want access to - as long as you can be rapidly reactive to a certain degree to open up those methods that ARE validly needed by consumers. I actually hate the idea of internalising stuff. 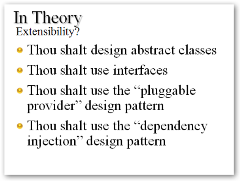 Unless the properties/methods could potentialy de-stabilize the component, they should be made public. [EditorBrowsableAttribute(EditorBrowsableState.Never)] so it does not appear in the IntelliSense. Sure the rightous path is somewhere in the gray area, as in most scenarios, however i think that leaning toward the virtual side is somewhat better. Most "average" developers will mostly use the Out-Of-The-Box features, and if incompetent poeple will do bad stuff while there was no team leader/architect/etc present, then it's probably their employer's fault, not the framework designer's fault. On the other hand, virtualizind stuff give the great developers out there the ability to use "closed source" libraries (such us, ADO.NET) for their needs, and develop new frameworks that can use existing behaviours and capabilities. I really enjoyed reading your reply. When I watched the presentation and heard your slide, I was a little distracted by all these thoughts about making things internal that I didn't pay much attention to the next couple of slides - I didn't realise that you were playing "bad cop" on that slide. While I used your presentation as an introduction to my post, my issue wasn't really with your presentation, but with all of the frameworks and libraries in the past that have felt so "closed in". After you highlighted a couple of things in my post I went back and re-read them, and in hindsight I think some of them sounded pretty harsh - but you can't expect much more from a country founded by convicts :) I hope you know I didn't mean any offence by them. I liked your final paragraph - that there's a good balance you need to strike between making an API that people can really take advantage of, while making something that you can actually support into the future. I'm more inclined to the problem is in the language. I think that if internal and sealed were able to be ignored, with some extended syntax so one would have to explicitly ignore the directive. From this point, it would now become an issue of "this class was not designed to be used/overriden by external entities, but feel free to ignore at your own risk". Here's something from our own experience at Xceed. One of the strong points users of most of our .NET components like is that we designed them to be extensible. We had our technical writer specifically create documentation on how you should go about extending the classes and what to look out for. Classes were built with this in mind. For example, our .NET data grid lets you extend its objects so you can create your own data rows based on ours, or group header rows, and many other elements. It works, and we haven't had any support nightmares from folks breaking it. Just developers who stretch the grid's ability beyond what our support staff can help them with, requiring some deeper help by the grid's original developers. In the end, we don't regret at all not sealing a lot of the classes, it is a decent selling point. Good post, Scott. As with any development effort, the key to success in designing an API is to have a solid understanding of your customer and how they intend to use your software. The "trick" involved with shipping rev 0.9 in barely-extensible form (everything sealed) simply forces a dialogue between you and your customer. 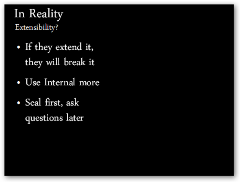 Use this communication to your advantage, and ship rev 1.0 with the correct level of extensibility. Most people don't know what they need until they start using it -- this is true for developers and non-developers alike. Remvove the guesswork. Talk to your customer! Normally, frameworks are quite specific in what they do and what they provide. If a whole 'chunk' (class) is required to be made public, then it may be the case that this functionality isn't in the realm of what the Framework was designed to offer. For example, should a class that lists the zipped files in a directory be exposed from a compression framework? Or, should a regular expression helper class be exposed from a logging/tracing framework? I think Dan is onto something. Just extend the language so that the developer has to explicitly acknowledge that they know they are using something that was not designed to be open, nor guaranteed to be supported. Add some syntax to every line when you call a private method, or override a non-virtual method, or non-public class, etc. After all, OO visibility is not about security - its not like you have to absolutely prevent people from using non-public classes/methods - you just want to guide the use of an API. This gives you the best of both worlds. API designers can still direct the usage, and make explicit what they will support. 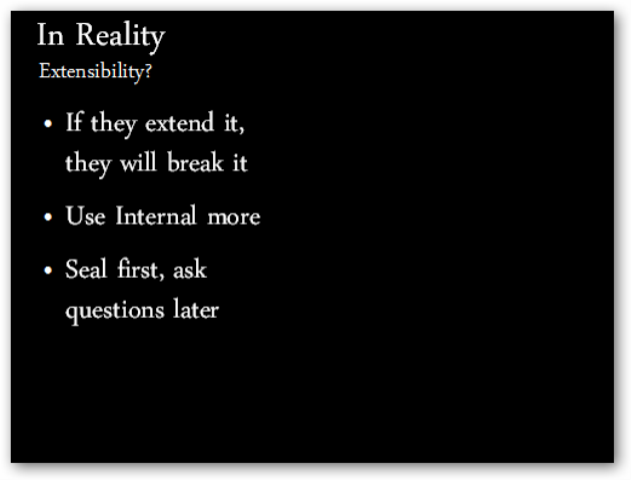 Developers can still stray from the path when they feel it is absolutely necessary, and acknowledge the consequences. The problem with this philosophy is that it only works when the public interfaces of classes are the only ones used by other classes and when the classes are well factored. In ASP.Net 2.0's ObjectDataSource, for example, there are tons of things done in the class (usually by static methods... a clear indication that this is poor cohesiveness) which should be a public helper methods in a some class that CAN be used. Instead, we all end up rewriting the whole class, or resorting to reflection to repair SIMPLE defects instead of being able to override and do the right thing by downcalling. So, my argument against yours is NOT that things should be public/private, rather what should be sealed (rarely, except low-level "ValueType-like" classes), and what should be public versus protected (NOT private). You could accomplish the same effect using an attribute like "UnsupportedAttribute"
Dave - not really. That would still leave the decision in the API author's hands. My point was putting the decision in the API user's hands. The API author states their intention using the visibility modifiers. The API user can then go against those intentions at their own risk with the new language syntax.